In this astonishing memoir, Paige tells a story that is both deeply personal and completely universal—one that will resonate deeply with the thousands of children and adults whose lives have been touched by bullying. Paige Rawl has been HIV positive since birth…but growing up, she never felt like her illness defined her. It never prevented her from entering beauty pageants or playing soccer or making the honor role. On an unremarkable day in middle school, while attempting to console a friend, Paige disclosed her HIV-positive status—and within hours the bullying began. She was called "PAIDS," first in whispers, then out in the open. Her soccer coach joked that she was an asset because opposing team members would be too afraid to touch her. Her guidance counselor told her to stop all the “drama,” and her principal said she couldn’t protect her. One night, desperate for escape, Paige swallowed fifteen sleeping pills—one for each year of her life to date. That could have been the end of her story. Instead, it was only the beginning. The gripping first-person account of Paige’s life will pull in even the most reluctant readers of nonfiction, and her call to action to choose compassion over cruelty will stay with them long after they turn the last page. Paige Rawl was born with HIV. As long as she can remember, Paige has taken medication at the same exact time, every single day. What makes that so different from taking insulin shots, using an inhaler, or covering up your eczema?, she wondered. At a middle school lock-in, Paige thought little of telling her best friend the truth about her condition. This trust and naive understanding of just how stigmatized some people can be would change her life forever. POSITIVE is a story for anyone who has ever been teased, bullied, or shamed. For anyone who has been taunted, beat up, and put down. 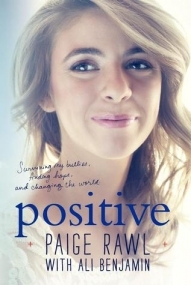 Paige's story is one not only of hope, but of fighting for your own strength and never giving up or giving in. It is a story choosing to be positive in the face of constant torment. Paige faced bullying for the rest of her time in middle school, from other students, her soccer coach, and friends of the family. She was misunderstood and ignored by school counselors and administrators. Teachers made few efforts to understand or change her shift from straight-A student to struggling learner. Paige learned quickly not to trust adults, and told no one at home about her problems. Paige's struggle with bullying led to her leaving the public school and being homeschooled for a year. For an extroverted, crowd-loving girl, this was torture. After Paige's mother brought a lawsuit against the school for its inaction in the face of her being bullied, another layer of difficulty was added to the girl's life. When it got to be too much, Paige tried to make it all stop by taking 15 sleeping pills - one for each year of her life - and she nearly died. In readable, relatable, and touching prose Paige Rawl and Ali Benjamin share the story of a girl who chose to stand up for herself, and for others who have been bullied for being something they did not choose. The most powerful message in Paige's story is her realization that in order to stop the torment, she would have to change herself. You cannot change other people, but you can make the decision to change your own life, and your own future. And you can try to change the world. Paige made these decisions, became an advocate for youth with HIV and AIDS, and spoke out against bullying. She is still doing these things, and she has made quite an impact. The message that spoke to me the strongest from Paige's story is the way in which her school counselors and administrators not only did nothing to support her, they discredited her accounts of bullying and implied that Paige herself - simply born with HIV - was the root of the problems. As someone who works with kids and teens every single day, I feel it is my responsibility to protect these young people, to support them in every way I can, and to listen to what they have to say with compassion and understanding. When teachers, those responsible for the well-being and education of our nation's youth for 6 hours a day, do not fulfill these responsibilities I feel furious, saddened, and honestly not completely surprised. Paige is working to change that by advocating for laws that make schools and their employees more accountable for inaction and lack of support in cases of bullied students. POSITIVE is highly recommended for middle and high school students, for teachers and parents, for caretakers and guardians. The additional resources at the end of the book provide a great starting place for those wanting more information on bullying, what's being done to stop it, facts on HIV and AIDS, as well as where to go for support groups and crisis hotlines. This must be my week of branching out from what I usually read and being rewarded. First I tried and liked a book narrated in poetry, and now a memoir. These types of reads aren't usually what I go searching for, though I have read some on cystic fibrosis and eating disorders. But when this came on my radar, I just had to get my hands on it. A girl who has HIV and with a suicide attempt but has so much hope now and life so turned back into the innocence before telling her friends about her HIV status. This to me, reads like a fiction, but it hurts my heart to know that the cruelty and hatred really happened. It is based on real characters. Some for the good but not all. I couldn't help but cheer every time that Paige learned more about her self worth and was able to put little piece by little shard of the painful time in middle school when she was bullied for a disease that was not her fault, and despite what a lot of people are wrong about, is not easy to spread in a social situation. The relationship Paige has with her mom is amazing. Her mom's attention to detail and being a yes mom really touched me. She was doing everything she could to keep herself and her daughter healthy and have the fullest life. But Paige's voice is what got me addicted. Unlike most fiction, we get a deeper look into her background. We get to the see the pills, the doctors on one side, that made her childhood different, and then her pageants, where she gained so many people skills and confidence. At first Paige's friendship with Jasmine seemed so perfect for a middle school friendship. They were always together, talking about everything from boys to birthday parties. But I guess that middle school friendships, or at least not all of them can handle such a weighty secret. And though unfortunately this friendship along with Lila, Yasmine's sister continues to be a sore spot and source of pain for her. I was glad to see the people in the book that stood by Paige, who let her know that it wasn't right what people had said and done to her and about her. They shared smiles, secrets and helped to lift her up. I loved hearing about the Aids walks, the camp for kids touched by hiv/aids where Paige was really able to be free. I am so proud of her that she was able to turn something awful, and then share with others through talks about bullying and the relation to suicide, getting involved with law making, and hopefully saving one other person, one at a time, that its never okay to say or do mean things to another person. No matter how different they seem, they all have a heart and soul that can be broken. Bottom Line: Powerful message delivered by a strong young lady.